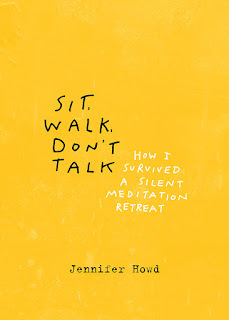 Recently featured on NPR’s Weekend Edition, Jennifer Howd is an author, editor, and a Certified Mindfulness Facilitator through UCLA’s Mindful Awareness Research Center. Her debut memoir, Sit, Walk, Don’t Talk: How I Survived a Silent Meditation Retreat, is published by Zen maste, Thich Nhat Hanh's publishing company, Parallax Press, and she posts about mindful living on The Huffington Post, as well as on her blog and social media channels. For more information, visit http://JenniferHowd.com. You’ve worked in marketing and development for the entertainment industry. It seems that most films (whether comedy or drama) are driven by conflict and lack of communication. Is it possible to tell “mindful” stories, or will they lose their entertainment value? It’s a complicated question because some might argue that the whole purpose of entertainment is to help audiences escape the reality of their present moment. And since mindfulness is all about being fully present in the moment—one might say “mindful” entertainment is an oxymoron. But conflict and lack of communication are part of our human experience, so it makes sense that they be mirrored in our stories, right? So, for me, I consider a story “mindful” if it has a clear intention to reflect society back onto itself—perhaps even helping audience members see themselves (or parts of themselves) in a new way. That can be wildly entertaining (for me, at least)! In a recent interview, Dr. Susie Wolbe mentioned a potential danger of the popularization of mindfulness: it may be seen as a cure-all or a quick-fix. Do you see any other drawbacks in the current mindfulness “trend,” or do you see it as entirely positive? My hope is that folks are savvy enough at this point to cut through media hype and be realistic in their expectations of what the practice might be able to do for them. But, I’ll come out and explicitly say that mindfulness isn’t a cure-all or a quick fix. Sure, there are absolutely benefits that arise from the practice. But they don’t typically happen overnight. I do see the mindfulness “trend” as positive, though, because folks are realizing the fast-paced go-go-go way of being that’s so predominant in our society just isn’t sustainable. It doesn’t feel good. And it’s time for a shift. At it’s most basic level, if the idea of taking a deliberate pause to reconnect with ourselves is resonating on a core level for folks—I can only see that as a healthy thing. You study secular mindfulness at UCLA’s Mindful Awareness Research Center. What have you been learning in the Certificate Program for Mindfulness Facilitators? Why is it important to have this type of training? Going into the program, I noticed I had expectations that we’d be learning mostly how to “facilitate” mindfulness. But, during the first practicum, it became clear that the program’s emphasis is actually on our personal mindfulness practices. The philosophy of the program is that a facilitator can’t facilitate mindfulness unless she embodies it. I absolutely believe this to be true—and that’s why this type of formal training is so imperative. At the Huffington Post, you gave experienced meditators “Tips to Help Survive Your First Silent Meditation Retreat." Do you have any tips for those of us who are just beginning to meditate? I think one of the most important tips for beginning meditators I could impart is to start small. Most folks want to dive in for 20, 30, 40 minutes when they begin—and I can say from personal experience, this is incredibly challenging to do. It’s a lot like going to the gym. If you’re new to weightlifting, you don’t want to start with a 100 pound weight. You’re apt to try and pick it up, get discouraged, and never hit the gym again. So, instead, consider starting off with something doable like 5 or 10 pounds and then go from there. When I first started meditating I could barely sit for 3 minutes! So, I’d say a great place to consider starting is 5 to 10 minutes and then build from there. For me, embodying (and subsequently role-modeling) qualities of mindfulness is what it’s all about—being present, connected, compassionate, kind, non-reactive, patient, accepting and loving. In a formal context, my personal mindfulness practice consists of daily sitting—usually anywhere from 20 minutes up to an hour or so, and I try to practice yoga a few times a week as a mindfulness-of-body exercise. I also attend day-longs at least a few times a year, as well as a more extended (5-10 day) silent retreat annually. Beyond that, I consider mindfulness to be a way of life, so it’s somewhat all encompassing. My partner and I practice mindful communication with each other (and our 7-year old son), and I’m consistently checking in throughout my day to bring my attention back into my present-moment experience. I consider my mindfulness practice to be the foundation for my life—so everything is grist for the mill… I regularly blog and write about my personal experiences with my practice and with mindful living, and I also share these stories in my mindfulness classes. I’ve mentioned the importance of embodying the practice—without the foundation of my ongoing mindfulness practice, the work of facilitating it would cease to exist!